Model Name: Daytona "Paul Newman"
Accessories: Accompanied by an additional Rolex Mk 1 acrylic Daytona bezel. An archetypal “Paul Newman” Daytona, this reference 6239 perfectly embodies the Hollywood legend. It is immediately recognizable thanks to its three-dimensional ivory dial with "Art Deco style" numerals. It was during the filming of “Winning” that Paul Newman fell in love with racing. His wife, Joanne Woodward, consequently gifted this exact Daytona variant to her husband, inscribed with phrase “DRIVE CAREFULLY ME”. It is thanks to this particular design that exotic-dialed Cosmographs are now synonymous with the philanthropic icon. Having resided in a private collection for many years, this timepiece is preserved in impressive condition and has aged gracefully over time. Showcasing full lugs, the satin finishes are crisp. The lug-holes remain a considerable distance from the edge of the case, evidence of its original condition. 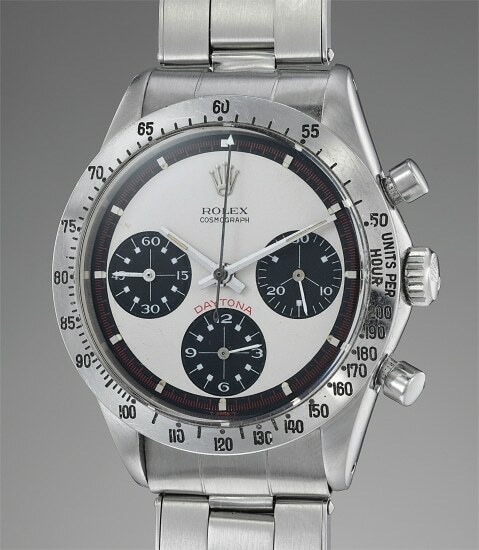 Most notably, this watch is offered with an additional acrylic Rolex "Mk 1" Daytona bezel in addition to the original one. Preferring the watch with black acrylic, the consigner had worn this timepiece often with the accompanying bezel in the past. Reference 6239 was introduced in 1963, which was a breakthrough year for Rolex. Named the "Cosmograph”, the model featured for the very first time a tachymeter scale on the bezel. While originally announced as the "Le Mans" it was eventually called "Daytona”.